Dr. Yun has been practicing family medicine for more than 17 years. Most recently he practiced with NGPG Thompson Bridge in Gainesville. He received his medical degree from the Medical College of Georgia and completed his residency in family medicine at Spartanburg Regional Medical Center in Spartanburg, SC. He is board certified in family medicine and is a member of the American Academy of Family Practice, the American Medical Association and the Southern Medical Society. 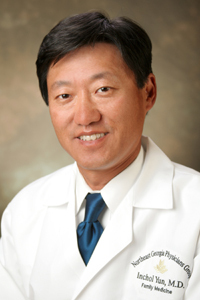 Dr. Yun lives in Suwanee and practiced in the Gwinnett area prior to joining NGPG in 2009. NGPG Hamilton Mill is located at 2089 Teron Trace, Suite 200, in Dacula. The practice is open 8:30 a.m. to 5 p.m., Monday through Friday. Dr. Yun will begin seeing patients at the Hamilton Mill location on June 6. Call 770-848-5300 to schedule an appointment or learn more about the services the practice offers. Visit www.ngpg.org/hamiltonmill for more information and to view a video interview with Dr. Yun.